Hope everyone had a fantastic holiday with family and friends! This was our first Christmas as Mr. and Mrs. Frenz, as well as our first Christmas living far from family. George and I enjoyed such a lovely quiet Christmas just for two. Though it was just us here in Coeur d’Alene, there was still the same running around, decorating, cooking and planning that goes with this time of year. As I was looking through my inspiration folders, the minute I saw the work of Vincent Giarrano, I knew these would be perfect for the day after Christmas..
Isn’t this how we all feel after all the merriment and overeating? Wouldn’t we all just like to curl up and nap all day long? Perhaps some of you will! 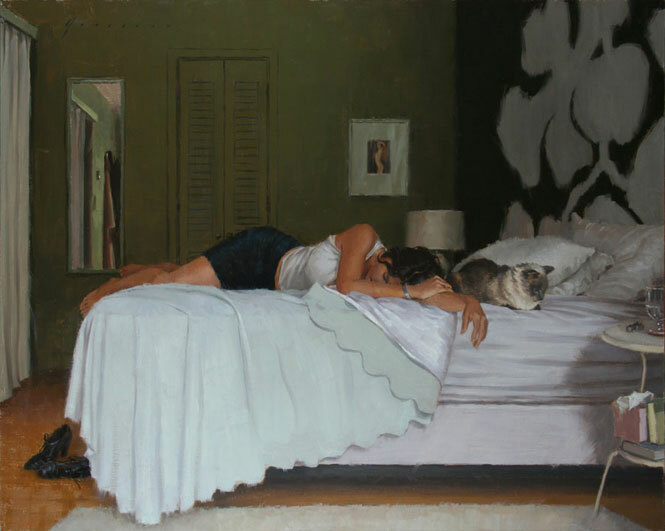 The textures and colors Giarrano uses convey such a sense of peace and coziness. I just want to curl up here, too! Here’s to wishing you lots and lots of post-holiday rest and relaxation! To see more of Vincent Giarrono’s work, please visit his website. 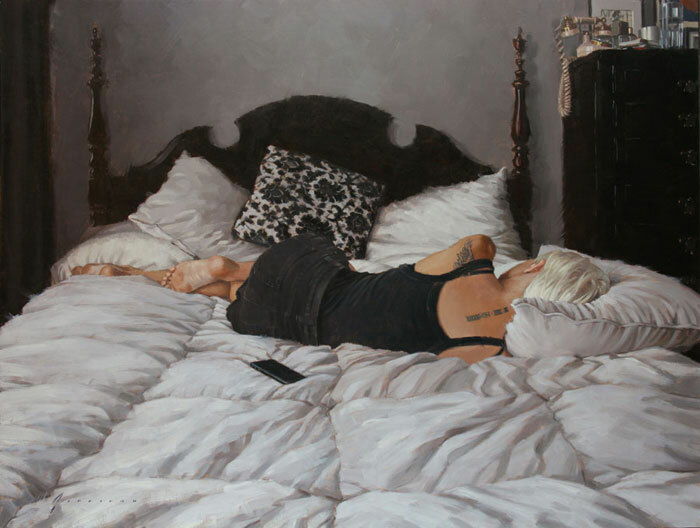 Featured image is Unmade Bed, oil, 20×16. Images are via the artist’s representing galleries, Gallery Henoch and the Grenning Gallery. Nice picks and beautiful portrayed. At first, I thought that was a picture of you sleeping on your bed with the cat, until I read your post:) I hear. Coeur d’Alene is beautiful. A vacation destination. Are you getting any snow? My husband and I did the cozy stay at home, bake a ham and scalloped potatoes and zucchini. A lazy day watching movies. “Midnight in Paris” a fun, artsy time travel adventure. And “Larry Crowne” a male Ugly duckling becomes a beautiful Swan. We liked it. Haha, no my cats are with the grandma in Florida! We love Coeur d’Alene, we had about 3 hours of steady snow on Christmas Eve, so while there was no fresh powder yesterday, we still had a white Christmas. There is supposed to be more to come this week and next! Midnight in Paris is on my “to rent” list! I bought my hubby Pearl Jam Twenty for Christmas ( his favorite band ever ), so that was our Christmas viewing treat yesterday. Glad to hear you enjoyed a lovely holiday for two, as well!